Olbia Airport also known as Olbia-Costa Smeralda Airport is an international airport located in Olbia on the northeast coast of the Mediterranean island of Sardinia. Domestic and international, regular and low-cost Airlines serve the airport with direct flights to many cities in Europe and worldwide. Olbia Airport has single passenger terminal. The services and amenities in the passenger terminal include apart from some food and drink establishments and shops, luggage storage, lost and found, a bank branch, ATM, and internet kiosks. We have tie-ups with best car rental suppliers at Olbia Airport such as Buchbinder, Sixt, Alamo to provide you a huge fleet of cars right up to luxury ones. Olbia is the gateway to the beautiful pearly white beaches of the northeast coast and the glittering Costa Smeralda. It is where film setters, jetsetters, and the glitterati arrive to indulge in a la dolce vita Sardinian-style. The town itself is not as pretty as the coast around but it does have a few attractions and more facilities than other towns. There are some internet cafes here; there are a few good Italian restaurants and some nice bars and pubs. The ancient history of this town can still be seen today. There is a Punic necropolis, roman baths, and old town walls. Olbia is also a worthy starting point for exploring Porto Rotondor the island of La Maddalena and the well-known resorts of the Costa Smeralda. 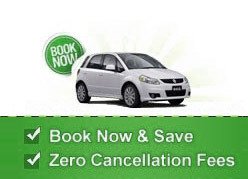 Contact our customer support team to book your car rental deal for Olbia Airport.